Fortunately, in Naples, Fla., assisted living communities are available that cater to your loved one’s every need and more. Finding the perfect community could take a little bit of work, however. You want to learn everything about an assisted living community in Naples if you can. You want to tour potential communities for your loved one, talking to residents and staffers. You should include your loved one in the process: After all, he or she will be doing the living in whichever community you choose. And you should ask questions—many, many questions. 1. What dining options does your community provide? Moving to a senior living community shouldn’t mean taking a step back in quality of life, including dining and nutrition. Ask about a community’s meal options. The best communities offer restaurant-style dining and three meals a day prepared by outstanding chefs. Some assisted living residents may have trouble eating, which is why The Arbor Company developed Dining with Dignity®. Through this program, chefs are trained to prepare nutritious, delicious meals that can be eaten with just seniors’ hands and are easy to chew and swallow. Residents are able to enjoy the full dining experience without embarrassment. 2. Are your apartments cozy? 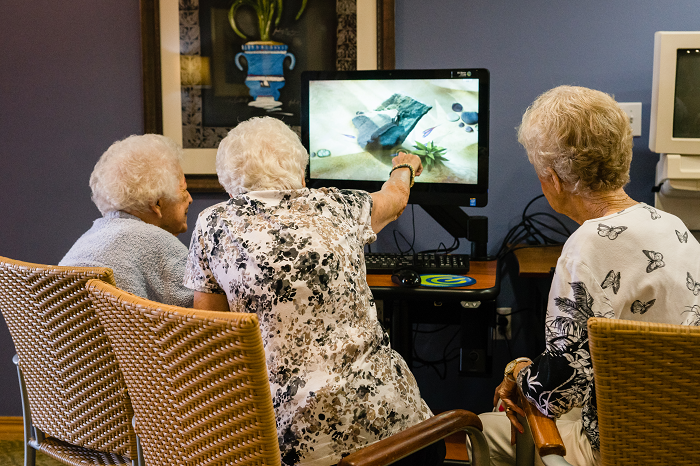 Ask to see floor plans and pictures of the apartments an assisted living community offers. Residents shouldn’t feel crammed, and even studios should have space for seniors to sit and relax somewhere other than the bed. Also, apartments should not feel like dorm rooms but, rather, like home; residents should have the ability to decorate and furnish apartments as they wish. 3. What does Naples offer seniors? Florida already is a haven for retirees, but Naples is truly a special city for seniors. Shopping, restaurants, cultural opportunities, a robust senior scene—Naples has it all. Moreover, Naples offers plenty of activities seniors can enjoy with their families, such as the Naples Botanical Garden and Naples Pier. And of course, the weather here is wonderful, to be enjoyed 12 months of the year. 4. How will you attend to my loved one’s unique needs? Seniors in an assisted living community usually require some sort of individualized attention, ranging from help with laundry to assistance with activities of daily living (ADLs)—or anything in between. The answer to this question will go a long way to determining whether a senior living community is right for your loved one. If a community isn’t ready to bend over backward for its residents, it might not be the best choice for your family. 5. What social activities and events do you host? Quality senior living is about making the most—or as much as a resident wants—of every day. Assisted living communities should be vibrant, welcoming places where residents are engaged, enjoying life, and anything but bored. Ask about social activities a community hosts, the types of events and clubs it offers, and what opportunities are available for residents to get out and about Naples. 6. How can my loved one alert you if there’s a problem? Many residents in assisted living are there because they need some level of monitoring and care they wouldn’t be able to receive at home. Therefore, if they experience a problem when a staffer isn’t around, they need to be able to contact someone for help. Proactive communities provide both wearable alert pendants and in-room call buttons so that no matter where a resident is, he or she can call for help when necessary. You likely have plenty of additional questions on your mind as you search for assisted living communities in Naples. We at Barrington Terrace can answer those questions. Contact us today to learn more about our outstanding assisted living community and to schedule a tour.